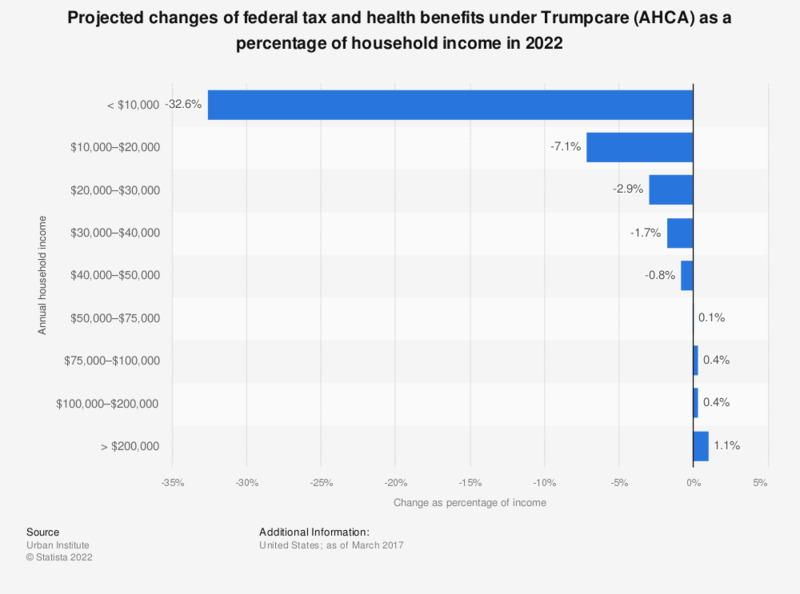 This statistic displays the projected changes of federal tax and health benefits after a possible implementation of "Trumpcare" (American Health Care Act - AHCA), shown as percentage of annual household income in 2022, by annual income class. It is estimated that low-income households would lose most under Trump's plan. A family with a household income of under 10 thousand U.S. dollars annually, for example, would have a net loss of 32.6 percent of their income, while households with an annual income of 50,000 dollars and more would have net gains. All figures are projections generated by the Urban Institute's Urban-Brookings Tax Policy Center Microsimulation Model (version 0217-1) and Urban Institute Health Policy Center's Health Insurance Policy Simulation Model (2017).